Water, Sodium Lauryl Sulfate, Sodium Laureth Sulfate, Glycol Distearate, Zinc Carbonate, Sodium Chloride, Sodium Xylenesulfonate, Dimethicone, Cocamidopropyl Betaine, Fragrance, Sodium Benzoate, Guar Hydroxypropyltrimonium Chloride, Magnesium Carbonate Hydroxide, Methylchloroisothiazolinone, Methylisothiazolinone, Blue 1, Red 33. I honestly have never reviewed a product in my life but I think everyone should know about this! I used to get acne all over my shoulders and the odd bit on my back. Since using head and shoulders once every day for the past 2 weeks I haven't got a single pimple my shoulders have cleared up completely. Make sure you have a shower, lather it into your skin, leave it for a minute and then rinse. REALLY IMPORTANT to use every day. I tried this before and it was on the days I missed that the one or two pimples came back. Btw not sure if this works for face but it definitely does for body! A good dandruff fighting shampoo! 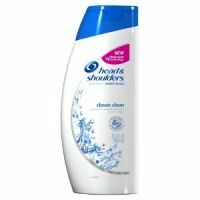 Head and shoulders is a very effective shampoo that helps get rid of flakes caused by seborrheic dermatitis. I'm using the formulation that includes pyrithione zinc to help rid of my dandruff. It works well however you want to include a couple of different types of shampoo so that you can rotate them so the seborrhea doesn't build up an immunity. The shampoo lathers well, fairly inexpensive and can be found virtually at any department store. This stuff this magic, it cleared my chest, back and forehead acne. I just wash my hair once a night. Great for chest and back acne! Just use once a day Keeps body acne at bay Good fragrance, no irritation Doubles as shampoo :) (I love it as a shampoo also) None I wash my body with Head and Shoulders Classic Clean every night in the shower and the results have been great so far. My back used to get pretty greasy/pimply all the way down to my tailbone, basically. I would even get occasional cysts there. It's summertime here and I don't want to have to worry about covering up my shoulders. Before, I used to have to wipe my body down with Sea Breeze twice a day to keep it clear, but now it's just H&S once a day which is so much more convenient. When I do get any pimples they go away so fast as long as I DON'T PICK. I'm still hesitant to try this stuff on my face though. Eliminates back acne FAST! also effective for neck/arm acne I herd using dandruff shampoo can cause dandruff. (if you dont already have dandruff). Your skin is quiet itchy when it is adjusting to it. After the first week my bacne improved 80%, and now its week 3 and i have one pimple on my back and its almost flat. directions: whenever showering lather this stuff on your back for about 30 seconds then wash off. Its as easy as that. clears back and (especially) chest acne, works fast, inexpensive, widely available no fragrance-free formula I suffered with chest acne for years before stumbling upon this solution on the Internet. 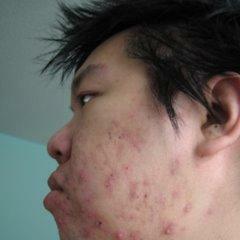 I had small, persistent, itchy, rash-like acne that was unresponsive to everything (inc. bp and various prescriptions). The key ingredient is the zinc pyrithione. Many derms agree this is the MOST effective ingredient in the fight against neck, chest and back acne. Within 3 days, my chest was nearly 100% clear with NO irritation. Classic Clean formula works best. Just lather and apply in the shower. Leave on up to 5 min. This has been nothing short of a life saver! Do the research, get the bottle and enjoy your clear skin!